Administratively, volcano Merbabu is located in Central Java Province, Indonesia. The area around the volcano is protected in the Merbabu National Park which is designated to conserve habitat of flora-fauna. Merbabu has several distinct ecosystem zones, popular ones namely tropical mountain forest, and sub-alpine vegetation. As a conservation area, Merbabu possessing authentic ecosystem, managed by zone system for scientific research, knowledge, education, supporting cultivation, tourism and recreation. So far, Merbabu ply very important role as water catchment area. In volcanological perspective, Merbabu is type B active volcano according to Indonesian volcano type classification.Today existing crater is dominated by fumarola in low gas pressure, some of them included bubbling water and little mud. The craters located below summit, and visible on the way climb. Merbabu has many several peaks, but highest and most favorite climbing destination are peak Syarif / Pregodalem (3119 m asl ) and peakKenteng Songo ( 3142 m asl ) Zone. These two peaks still dominated by some type of vegetations which are well adapted on high altitude. For trekking travelers, peak Syarif is best point to enjoy sunrise in the area, while peak Kenteng Songo is best point to see early morning view of volcanoes of Yogyakarta and Central Java specially the most active volcano Merapi in "closed up view". locals of Merbabu are farmers keeping the spirit of working hand by hand which is locally popular named "Gotong Royong". Today, there are many summit routes available which are accessible by non technical climbing, but physically moderate to challenging hike. A 2 Day / 1Night double summits trekking Merbabu leads you via starting point of Wekas - Kedakan Route through cobbled road of village and high farmland, path of tropical mountain forest, typically sub alpine vegetation and volcanic zone of Merbabu. 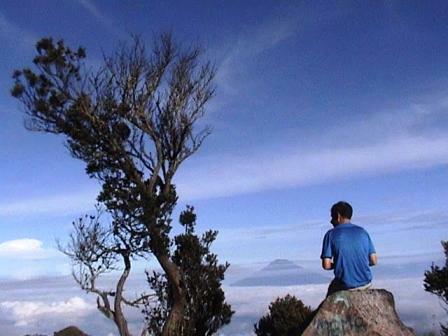 Here you'll ejoy the tranquillity of mountain forest, and volcanic zone below summits which is so spesific for B Type active volcano Merbabu. On this journey, you will be guided head for peak Syarif to see sunrise plus beauty of surrounding jagged volcanic peaks, then traverse volcanic rock leading us to highest peak of Kenteng Songo area to see " closed up view" of volcanoes surrounding specially the most active volcano Merapi. On the way hike down back, we have chance to see the old crater in closer distance before arriving at trekking basecamp of sub village Kedakan.We climb those peaks in all season, but best seasons are from April to October.